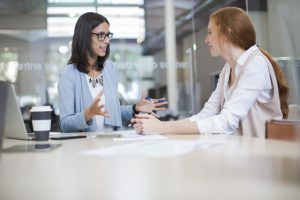 applying appropriate verbal behaviours during a coaching conversation with a sales rep . .
Our studies show also that 20-40% growth rates can be achieved in sales when coaching is done effectively. Additionally seller retention rates appear to benefit from the presence of a strong sales manager with outstanding coaching skills. Motivated sales people can do wonders, if they want to! Sales people need a safe learning environment that will grow their motivation, knowledge and skills. This is sales management at its best. An outstanding sales manager also has the potential to become an outstanding coach. She will nurture the sales rep to reflect and seek own commitment for relevant actions for the ongoing practice of skills and strategies, enabling him to stand out in his conversations with customers. So as a sales manager, what can you do to improve your coaching skills? Our latest observational research shows that using the appropriate coaching style and related verbal behaviours, applied in a timely manner, are crucial factors for motivating sellers. Practice is needed to master these coaching styles from setting clear boundaries and direction, then teach if needed, mentor if wanted and coach sales skills and strategies on the fly. Why does coaching style matter? If your coaching style and related verbal behaviours do not meet the competence and consciousness of your individual sales reps, then you risk demotivating them at best and losing them at worst. Your reputation as a sales leader is at stake. Most sales managers have never been trained to coach, nor had the chance to practice. They jump from a being a successful seller directly into the management role without the necessary management or coaching skill. It’s no surprise therefore that they fail to master the behavioural skill sets, or the strategies and structures that accompany an effective sales coach. Finding the time to coach is an objection we hear a lot, perhaps unsurprisingly. Many factors compete for the sale manager’s time and attention. Meeting departmental targets being the biggest. But you can’t achieve that without a motivated sales team committed to life long learning, growth and success. And that’s the role of coaching. Coaching is not a tick in a box. Consider it a vitamin injection in your daily conversations with your sales people. Coaching is an ongoing task. And coaching skills and strategies are a language you master that underpins every interaction in some form. How to be ready and how to recognise what an outstanding coaching conversation looks like? To improve your coaching skills Huthwaite’s Dr Janet Curran has summarised a few simple and actionable guidelines, to help you start your coaching learning journey. The Five Golden Rules of Effective Coaching.